I'm often asked what it is that I do in my spare time. Besides golf, bowling, travel and gardening, I like to study my tiny research insects, the Ammoplanines. I have been studying and publishing on these wasps since first becoming a graduate student at UC Davis. My professor introduced me to them and I have been infatuated with them ever since. They are very small, the largest being barely over 3mm. This is about the same size as many parasites, which is so important to the success of biological control. But they are not parasites. 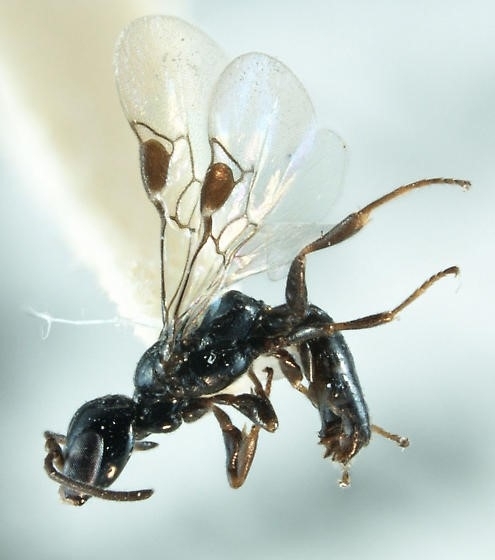 They are actually predators, physically capturing their prey and paralyzing them with a sting, then taking them back to their nest to provide them to their potential young. Many often take thrips as prey, tiny flower pests that are smaller than they are - others may take aphids. I compare these to the tigers or wolves of our world. If they were the size of a mountain lion or a bear, they would be terrifying. A huge head and mandibles that could grab you and lift you off the ground, paralyzing you with a vicious jab of a lance and injection of toxin. Thank goodness they are only 2-3mm. I also compare them to a jockey. Small in stature but tougher way beyond their size. How tough are they? They live in some of the most inhospitable habitats in the world. The Nevada and Utah deserts, the Mohave Desert in California, canyons in Palm Springs, above 7000 ft. in the Sierra Nevada and on the island of Santa Catalina - well ok, that last one was not so bad. During their activity period, they must emerge successfully from their cell in the soil and find a mate. Well, if you are a male you must find a mate. Generally, females have to wait just a few minutes after emerging and the males will find them. After mating, females must get busy finding and excavating a nest site. This includes digging into hot, hard compact soil or sand. From a main tunnel she will construct 6-8 cells. She will lay an egg in each cell, and then must go out and find her prey; as I mentioned above, thrips. That means flying to nearby flowers where the thrips are present. She searches among the flower petals, grabs one with her mandibles, stings it, then carries it back to the nest. Each cell can hold about 6-7 thrips so multiply that by 7 cells and you can see how often she has to go back and forth between the flowers and her nest. In her lifetime, she may complete 4-5 of these nests. All the while having to find a source of moisture so she won't get dehydrated, and a source of nectar to keep her energy up. Once these nests are complete, they must withstand temperatures of 115 degrees in the desert, and 20 below zero in the high altitudes. The cells are evidently waterproof, preventing the wasp larva inside from dehydrating. But desert nests must get enough rain to moisten these cells or hatching will not take place. They can probably go for years under the soil before conditions are good for emergence. Despite all this, they have been around for millions of years. Obviously, what they do is successful. Tiny but very tough. Nature is always amazing to me.